The name Charles Darwin is virtually inseparable from the debate of origins. 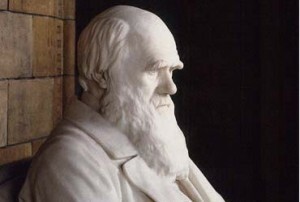 Even if his evolutionary hypothesis was unoriginal in itself, Darwin has proved to be the most effective (and thus most memorable) communicator of the concept. As a literary figure, Charles Darwin accelerates his proposition by defining the debate. Since the initial evolutionary model is more so a reinterpretation of observations in the natural world than an actual confounding discovery, monopolizing dialogue on the issue is understandably the smartest route to take while introducing a topic in the speculative Victorian era. When analyzing the writings of Darwin, it is insightful to keep in mind that he has not been trained as a scientist, but as a clergyman. Darwin, as theology-student-turned-naturalist, writes to make disciples of his scientific “gospel”. He seeks common ground with readers by addressing them as co-observers, telling them “[w]e will now discuss,” “[w]e behold,” and “we often see” (1539) the struggle for existence and the minor changes within species that occur because of it. This easily comprehensible beginning sounds non-threatening enough, and offers a launching pad for a more radical extrapolation. “I see no good reason why the views given in this volume should shock the religious feelings of anyone,” (1541) says Darwin, beginning the fifteenth chapter of The Origin of Species. This brush with religious sentiments is a hint of what Darwin uses to define the debate. This appeal to progressive sentiments makes for a persuasive maneuver in cultural debate. Thomas Huxley gladly inherited Darwin’s pride in monkey heritage in the 1860 debate at Oxford. Huxley, known as “Darwin’s Bulldog,” is representative of a particular audience drawn to the evolutionary doctrine of origins. Darwin argues that evolution should make mankind feel noble, because man’s evolution to the “summit of the organic scale…may give him hopes for a still higher destiny in the distant future” (1549). This idea sounds absurdly fanciful to some, but is readily embraced by others, especially disillusioned thinkers who want a void in their lives to be filled with meaning. Darwin essentially fills this void by deflating it – if there is no intricate plan for the universe, and thus no individual plan for our lives, there is therefore no need of salvation except by man’s own power and struggle for survival. The premise of Darwin’s The Origin of Species is that the observations he made initially in the Galapagos might shed some light on that “mystery of mysteries” – the origin of species. Judging from this inquisitive approach it becomes more apparent what sort of audience this book will appeal to. Those who believe in a literal interpretation of the Bible are not likely to find the origin of species to be a “mystery of mysteries,” because the Bible offers the explanation that God created every living thing according to its kind. But skeptics who are disheartened towards or doubtful of the existence of God will immediately feel a kinship with the author. Notice, however, that Darwin is careful not to dismiss God entirely. Whether or not he still personally believes in “the Creator” he mentions, or is merely trying to sound culturally acceptable is not immediately apparent. But Darwin does make the well-known Creator of the Bible seem less likely, because the evolutionary model diminishes the role of a designing God. In light of this conclusion, the references to “the Creator” sound equally diminished. Perhaps Darwin is willing to use them as a sort of classical idiom, just as the Greco-Roman gods and goddesses are utilized by poets and lyricists. He also refers to man’s “godlike intellect” and “exalted powers” (1549), which shows how difficult it is for even the most secular author to avoid communicating with religious connotations. Viewing the origins debate as an issue of limited dimensions has been a fashion of the past century, with a tacit aspect of culture being to not bother questioning scientists unless one is prepared to reconcile their religious views. The success of the evolutionary model may be credited to Darwin’s success at compartmentalizing the issue between those working in the field of science and those who are not. This makes evaluating Charles Darwin as a literary figure an intriguing venture. It is surprising to find that the roots of the debate are just as (if not more) metaphysical and emotional as they are scientific. Darwin, Charles. The Origin of Species. The Norton Anthology of English Literature Volume E: The Victorian Age. Ed. Stephen Greenblatt 8th ed. New York: W.W. Norton 2006. 1539-1545. Darwin, Charles. The Descent of Man. The Norton Anthology of English Literature Volume E: The Victorian Age. Ed. Stephen Greenblatt 8th ed. New York: W.W. Norton 2006. 1546-1549. May I take a hint? I’d love to go to England anyway. Excellent post, Amanda. You hit on something I had not noticed before, but once you pointed it out, it becomes readily apparent. Yes, Darwin himself tried to portray his views as "settled science." Since his time, others who promoted his views try to do the same, even though the science is anything but settled. It seems that at least in regards to this tactic, not much has changed since Darwin's time!